On the pristine white sands of Talalla beach lies Talalla Retreat, a purpose built yoga retreat centre on the south coast of Sri Lanka. Green and spacious, Talalla is a calm oasis in which to spend a yoga holiday. Running from Sunday to Friday every week, the yoga retreat package has lots of wonderful inclusions. 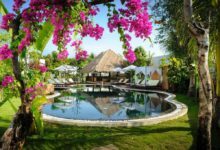 As well as twice daily yoga, also included is a private yoga class, weekly excursion and a treatment to ensure a truly relaxing trip, and all for excellent value. 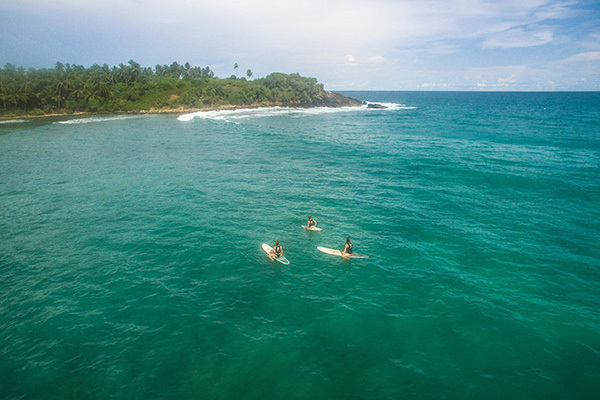 Guests can also surf from Talalla Beach and lessons are available for those looking for some adventure as well as relaxation. In your spare time, enjoy relaxing by the pool, swim in the clear Indian Ocean, visit the local village, schedule a spa treatment, get an auyvedic consultation, experience one of the local Buddhist temples, and make friends with other yogis on retreat! The open-sided restaurant serves delicious, healthy cuisine, bringing together the flavours of Sri Lanka and Western foods. 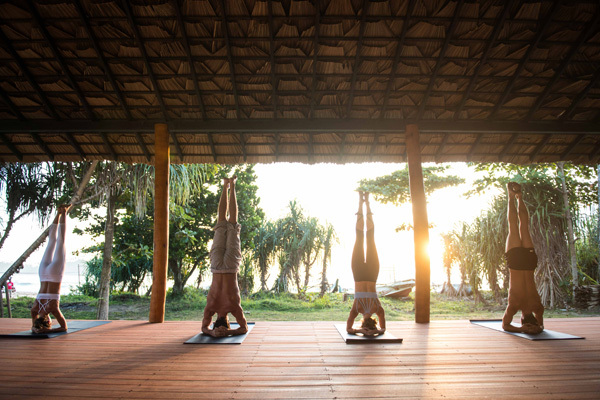 Herbs and vegetables are grown in Talalla’s own garden and fresh fish is caught each day by local fishermen – the perfect accompaniment to a yoga retreat. Talalla has 3 resident yoga teachers who all offer flowing and authentic sessions. 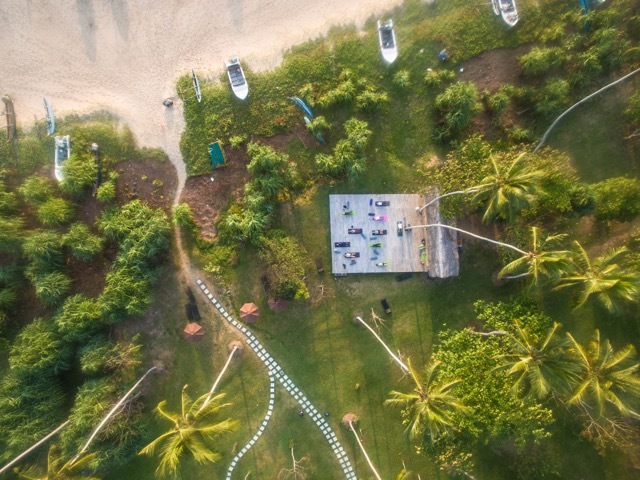 They’ve designed weekly retreats to help you deepen your yoga knowledge and connect with your fellow travelers. We recommend starting the day with quiet reflective time to breathe with the waves while watching the sunrise over the ocean. Vinyasa is a style of yoga that uses the connection of breath to link posture to posture in a continuous and rhythmic way. Variations will be given to accommodate practitioners of all levels. Led by our resident yoga teachers, these daily workshops will be an opportunity to explore other aspects of yoga that are not covered generally in regular yoga classes. Taking time to unwind and slow down, this session focuses on developing breathing practices and meditation techniques such as mindfulness, visualization, and more. Restorative yoga initiates the relaxation response to decrease levels of stress, increase blood flow to organs, and taps into the energetic subtle body. Props such as bolsters, blankets, and straps are used to support the body in poses. Yin Yoga focuses on long holds in poses to work the connective tissues such as ligaments, bones and joints of the body. Yin can be focused on pushing your edge or holding the pose in a soft passive way. For those looking to experience more, Aerial, Vinyasa and Restoartyive Yin can also be arranged upon arrival. These are our guide prices for staying at Talalla during low season. The yoga retreats runs from Sunday afternoon through to Saturday morning and extra nights can be added, along with additional yoga sessions for those wanting to deepen their immersion. If staying for 2 weeks we will also try to arrange a special discount for you. We can also help arrange your flights for you- flying to Colombo and then a short seaplane trip from their down to the South Coast (land transfer is also possible but takes approximately 2.5 hours).